Every 3 years, the OECD conducts the Program for International Student Assessment, or PISA. Administered in over 70 countries, it attempts to standardize hundreds of variables about education into a digestible ranking system. This year, Korea and Finland topped the charts in all categories. However, the most interesting finding to come out of the survey was that Shanghai Province in China surpassed every country in the world by a significant margin. Apples to oranges you may say, but remember that most of the countries in Europe have lower populations than Shanghai. 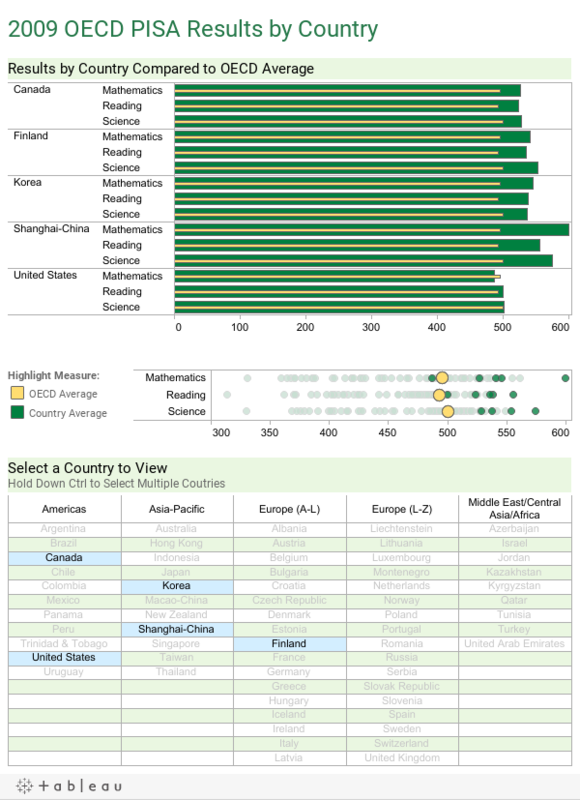 Select a country or countries to compare using the table at the bottom of this visualization. This view is meant for comparisons. Use Ctrl to select more than one country, or click the "Continent" header to view all of the countries in that column.